As competitors continued to chip away at its market share, Nespresso has been spending heavily on marketing and R&amp;amp;amp;D to stay ahead, two areas in which the company is known to excel. Furthermore, Nespresso, and Nestle overall, have been increasingly looking for ways to innovate and digitalize the company. Predicated on the idea that anyone can make the perfect espresso just like those served in the best Italian cafes, in 1987, Nespresso created and dominated an entirely new coffee category, the gourmet single-cup coffee market. 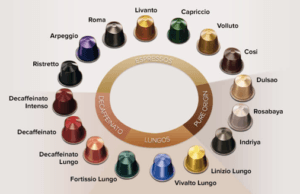 The product consists of high quality, individually-portioned coffee in aluminum capsules for use in specially-designed machines, sold at household appliance retailers and the Nespresso shop (See Figure 1a and 1b below). By the 2000s, Nespresso had become Nestle’s fastest-growing product line, growing at 40% annually, and the company continued to expand its coffee expertise by creating unique new blends. Nespresso was regarded as an example of Nestle’s spirit of discovery and ability to innovate and Nestle built a new consumer experience with the unique “razor-razor blade model” for coffee, technology, machine, and capsules. Although Nestle enjoyed its success for many years, its success eventually led to the entry of many competitors in this lucrative single-serve coffee business, where profit margins for one capsule could be up to 50%. By 2012, Nestle dominated the single-cup coffee market with a 34% revenue share (See Figure 2), and chief amongst the competition was Keurig Green Mountain, who had become the dominant player in the North American market. In addition, Nespresso’s patents began to expire in 2012, gradually allowing competitors to release similar machines and capsules. 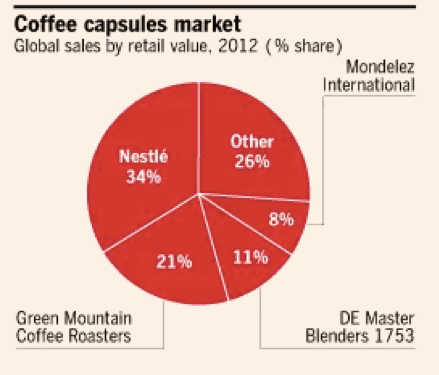 For example, competitors such as Keurig Green Mountain (formerly Green Mountain Coffee Roasters) were releasing their own version of single-serve machines and capsules, while other companies such as Ethical Coffee Company SA and Mondelez International Inc. were producing less expensive capsules that were designed to be compatible with the Nespresso machine. Figure 2. Coffee capsules market breakdown, 2012. Nestle tried to maintain its grip on the capsule market through the use of its numerous patents and legal action against some of its rivals, but had little success. Furthermore, in 2013, one of Nestle’s patents covering the Nespresso coffee system was revoked, further hurting the conglomerate’s attempts at protecting its brand. 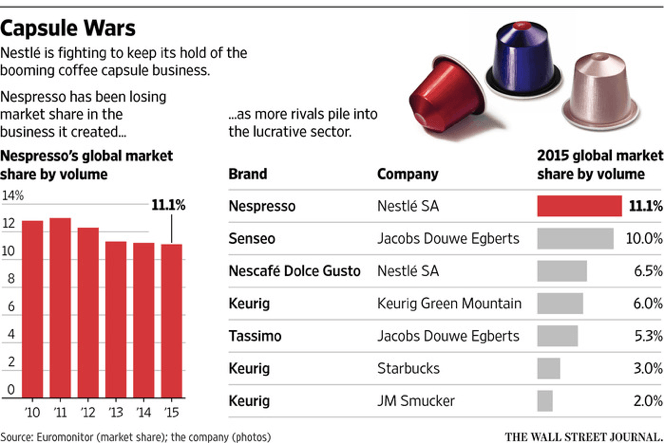 As a result of these changes, the Nespresso brand has been losing global market share, by volume, to competitors. Nespresso controlled 11.1% of the global capsule market in 2015, down from 13% in 2011 (See Figure 3). As competitors continued to chip away at its market share, Nespresso has been spending heavily on marketing and R&D to stay ahead, two areas in which the company is known to excel. Furthermore, Nespresso, and Nestle overall, have been increasingly looking for ways to innovate and digitalize the company. How has Nespresso been attempting to digitalize and transform the company? Nespresso’s overarching goal, or job-to-be-done (shameless BSSE plug), has always been to deliver the perfect coffee experience. 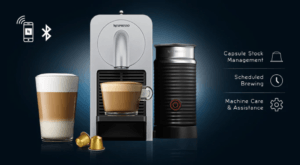 Through its incorporation of technology, it has been able to focus even more on the experience aspect of its products and in recent years, Nespresso has created a transformative experience for its customers. Overall, they have enabled simple digital transactions, drove personalization and customization across channels, leveraged digital media to craft and deliver is brand, and blended digital and physical channels for a meaningful experience. Leverages a cloud-based customer engagement solution that synthesizes all consumer data (web and app orders, in-store orders, behavioral analytics, interactions with Nespresso kiosks) all in one unified customer view. Allows the company to make recommendations and target media. However, possibly one of the greatest ways in Nespresso has made strides in its digital transformation is the creation of the Prodigio machine, which makes the Nespresso machine a part of the IoT revolution (See Figure 4). The Prodigio connects the machine to your smartphone via Bluetooth technology and offers additional benefits through the use of its app. The Nespresso app alerts your phone when the coffee machine needs service maintenance or water tank refill and also lets you set a time for the machine to make coffee. Furthermore, the app lets you reorder capsules before you know you need them, allowing you to order with one touch. Because the individual capsules are at the core of Nespresso’s business model, the Prodigio allows Nespresso to go after this revenue. While Nespresso claims that it offers a seamless omni-channel experience, the line between digital and physical has not been blurred enough, providing a less cohesive experience. For example, Nespresso should think of ways to allow its consumers to continue an order online that wasn’t finished at the store, since consumers want an experience that caters to where they are. Instead, as of now, consumers must restart their order. Since Nespresso is focused on creating the best customer experience possible, its customer service would be much better if representatives could pull up a customer’s profile and get a better idea of who the customer is, what their preferences are, etc. Great post, RPark, thanks! I am a big fan of the Nespresso offerings, and I find the battle for market share between single serve providers very interesting. I wonder whether there is a play for Nespresso in creating a subscription offerings of cups, using data from the Prodigio? I like the bluetooth connected functionality of the Prodigio, and think that Nespresso could gain insight for its users, regarding consumption habits and which household user prefers which type of cup. Nespresso could then begin to offer a weekly/monthly subscription service of cups that would be based on the preferences of the consumer, and delivered right to their door. This would reduce a friction point of having to re-order. Great post! I used to work with Nestle, I miss the free Nespresso at work! I’m really interested in the IoT angle of the Prodigio machine. I’m wondering if they could expand this to become a B2C play. With companies trying to keep millennials happy with office perks, I can absolutely imagine an office IoT play. Offering high quality coffee, easy automated reordering of pods, and cost savings by only ordering the pods that people like (rather than those value packs with flavors like decaff that we always have too many of). Also, perhaps the machines could automatically turn off at non-peak hours to save on energy costs. Awesome topic! I agree with the comments above around a subscription type service, especially as Nespresso improves its IoT capabilities. In addition to providing seamless capsule delivery for customers, the company can also use the data collected from Prodigio to help maintain the machine and prevent the machines from malfunctioning. This type of constant customer and machine monitoring will also require changes on the business side, as customer service functions will become increasingly important. 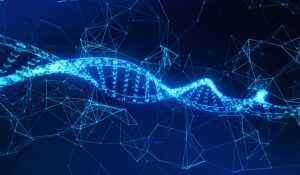 The Company will need to train its existing employees on how to analyze customer data and remotely diagnose problems with the machines in order to provide the best services for its clients. 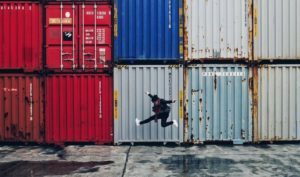 It’ll be interesting to see if the Company has thought about these challenges, and whether or not they are prepared to handle potential changes in their business model and organizational structure. Thanks for the post. The struggles that Nestle faces reminds me of the struggles that Sephora faces. At the core, they need to add differentiated services to ensure that customers stay within their ecosystem and continue to purchase Nespresso capsules. However, the large difference here is that Sephora has strong relationships with its key brands (helped by the fact that are all owned by LVMH). Nestle, on the other hand, depends on customers to make the initial Nespresso or Prodigio investment. Thus, Nestle is at greater risk of losing to competitors if they are able to catch up to the digital upgrades in the new machines. This may not be difficult, especially as customers may not require significant bells and whistles for their product in a world where so many companies are offering data to consumers. For instance, some consumers may find it easier to maintain all their shopping needs (and thus reminders, re-orders, etc) within Amazon.